"One of today’s best antivirus programs - for free!" Avast! 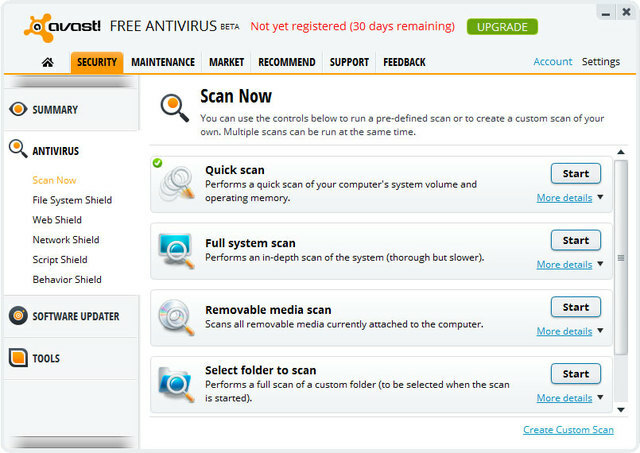 Free Antivirus is one of today’s most thorough and complete antivirus programs. And since it’s free, it’s no wonder why it’s also one of the most popular. This scanner significantly improves the security of your computer, protecting it from viruses and other cyber threats, so you can have peace of mind as you browse the web. All you do is set it and forget it. Tell the program how frequently you want it to scan your computer for suspicious or malicious files, and Avast will automatically perform its analysis at those times. Best of all, the scan runs in the background, so it won’t interrupt whatever you’re doing on your computer and it won’t impact performance, even if you’re gaming or doing anything that consumes a lot of resources. Cyber security threats are constantly changing, so the fact that this program will automatically update itself is a big plus. As an extra security measure, in additional to the scheduled scans, every time you put a new file onto your computer from the internet, email, etc., Avast will scan the file for viruses. You just have to wait a second before opening them while they are analyzed.